The week that Pokémon GO came out I was pretty much at home the entire weekend hanging out with family for my kids’ birthday party. I was lucky that my house happens to be a frequent spawn point for wild Pokémon so I was able to log on every so often, catch a few, then return to what I was doing. Upon returning to work I found the same was true. The existence of plentiful spawns even while remaining stationary was what kept me logging in and, eventually, becoming a very serious player. 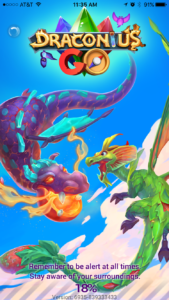 So far Draconius Go is not sucking me in and it’s only for the reason that it does not share this in common with Pokémon GO. 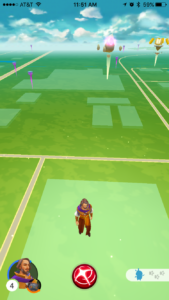 Draconius Go does an amazing job of solving the Pokéstop and gym problem that Pokemon Go has in rural areas by scattering them all over the place. If it could do this same thing with spawns I think I would have leveled up a bit by now. However, at my current spot in the game, I’m teetering on the edge of continuing to play and just abandoning the game all together. Overall I’m much more impressed with this obvious clone than I thought I would be. I thought I’d play it for five minutes then never touch it again. I was surprised to find out that it brings a lot of elements to the table that Pokémon GO was (and still is) sorely missing. I’m not sure I’ll put anywhere near the time into this game that I’ve put into Pokémon GO but it would be a pretty quick fix to get some more casual players more interested. Previous PostPrevious Is the Pokemon Go Halloween Event Already Over? Next PostNext Pokémon GO EX Raid Pass Changes?